You are here: Home / Jewelry / Earrings / Pretty, pretty earrings. This is a post dedicated to pretty earrings; these earrings aren’t innovative, they don’t have storied pasts, and they may not be the belle of the ball, but they’re all beautiful and I’d be thrilled to wear any of them. These amethyst and diamond earrings might be my favorites of this pretty earring roundup. The lines are so lovely, with the gentle antique-inspired texture and subtle curve of the diamond-set links and the dreamy pear-shaped faceted amethyst drops. Oh, kunzite. How wonderful you are. 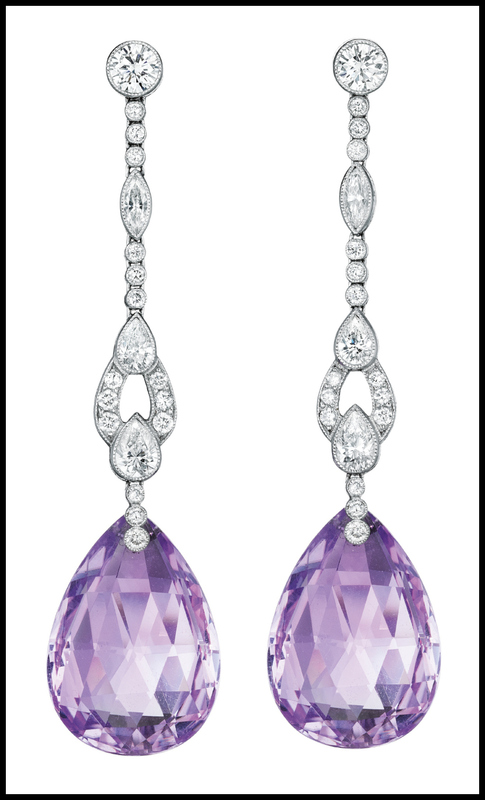 These glamorous white gold earrings each feature a curcular-cut diamond line that ends in a large, pear-shaped kunzite. These beauties measure 3 1/2 inches long and the kunzite drops total approximately 51.23 carats. These lovelies remind me strongly of the Tiffany and Co. conch pearl earrings that Daisy wore in the recent Great Gatsby movie. 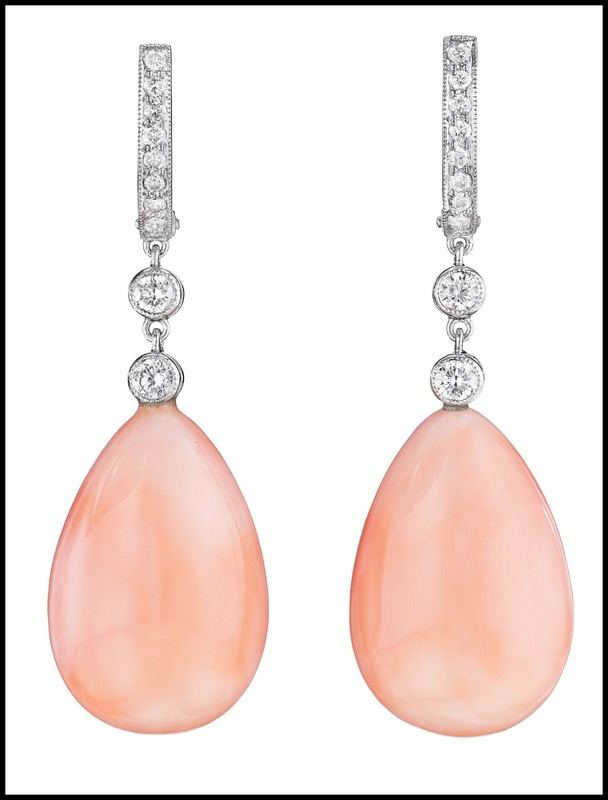 These earrings are made with coral drops rather than conch, but the softly sparkling pink and diamond effect is very similar. The edges of the diamond-set parts are millegrained, which lends a lovely texture. These pretties boast kunzite drops as well, dangling here in good company with diamonds and pearls. Lovely. I thought I’d test to see if you were paying attention. They’re pretty earrings, objectively speaking, but it’s undeniable that it also looks like they’re adorned by tiny detached baby feet. Coral feet suspended from 3+ carats of diamonds, but still. Which pair of earrings is your favorite? What do you think of the feet!? These pretty earrings were all listed in various auctions. Please see individual descriptions for links to listings. The feet made me laugh, cute, but I’d never wear them. I do love coral tho, so it’s a toss up between the coral drops or the amethyst (fabulous!) ones at the top.